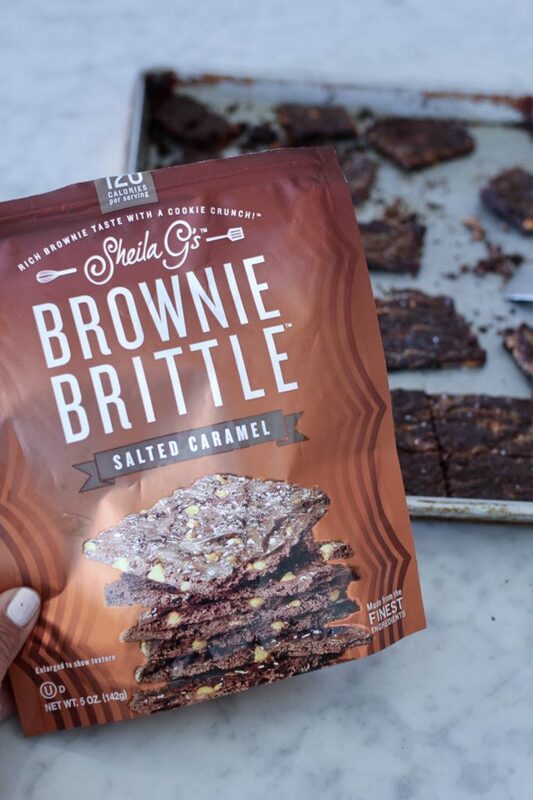 Have you tried Sheila G’s Brownie Brittle? 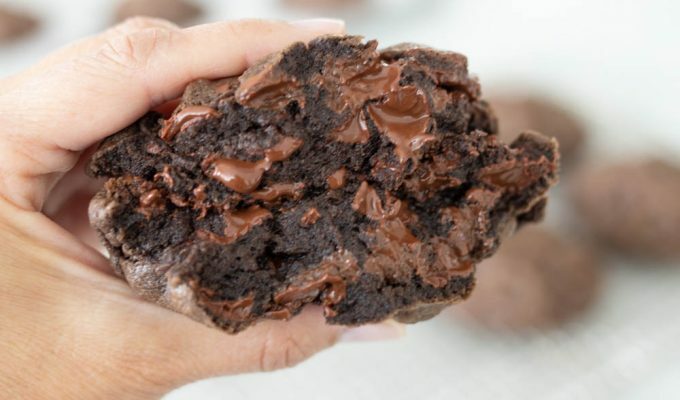 It’s like a brownie and candy in one yummy treat! Salted Caramel Brownie Brittle is a recipe I knew I had to create at home, after trying Sheila G’s Brownie Brittle on a Delta flight a few years ago. It’s a Brownie. It’s Brittle. All in one treat. Salted Caramel Brownie Brittle has the flavor of a brownie and texture of brittle (think peanut brittle, only not so hard on the teeth). Most brownies are thick, and either soft and chewy or cake-like. This brownie is the complete opposite. 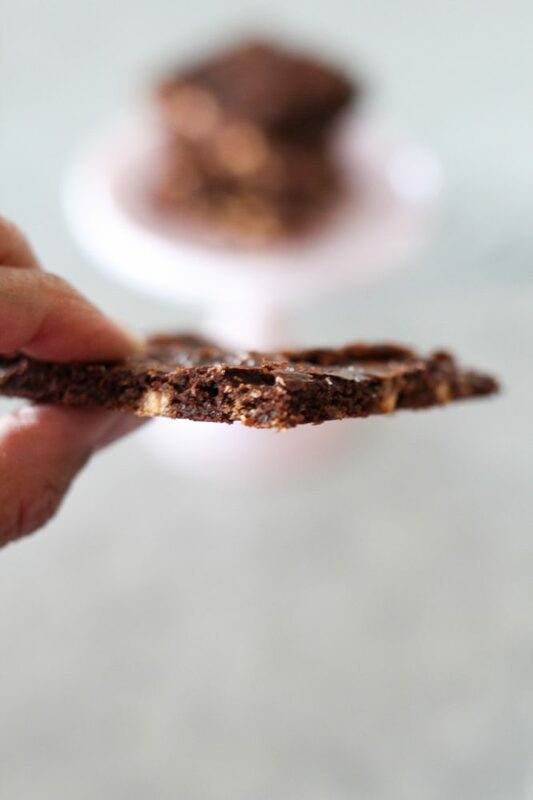 When making Salted Caramel Brownie Brittle, you need to spread the batter thin to achieve the brittle type texture in Sheila’s Brownie Brittle. Salted Caramel Brownie Brittle tastes just like the packaged treat, only better, because it’s homemade! I tried nuts, chocolate chips, and salted caramel chips when developing this recipe. Salted caramel chips are my favorite, which isn’t a huge surprise, since it’s my favorite of the Sheila’s packaged variety as well! I purchased a Kroger (store) brand Salted Caramel Chip because that’s what was available the day I tested this particular combination. Hershey’s sells a Sea Salt Caramel Chip in Target and Walmart for about $2.50 per bag. Baking once was not enough, this brownie needed a second bake to achieve just the right crispy texture. If you just bake once, the brownie is still soft in the center. 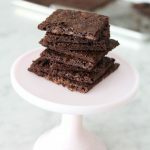 Cutting and then baking again will yield the crispy brownie you’re looking for in a true Sheila G’s Salted Caramel Brownie Brittle copycat! I also experimented with eggs in this recipe. Sheila G’s lists egg whites as an ingredient. I did see a significant difference in the batches I made with whipped egg whites, versus whole eggs. 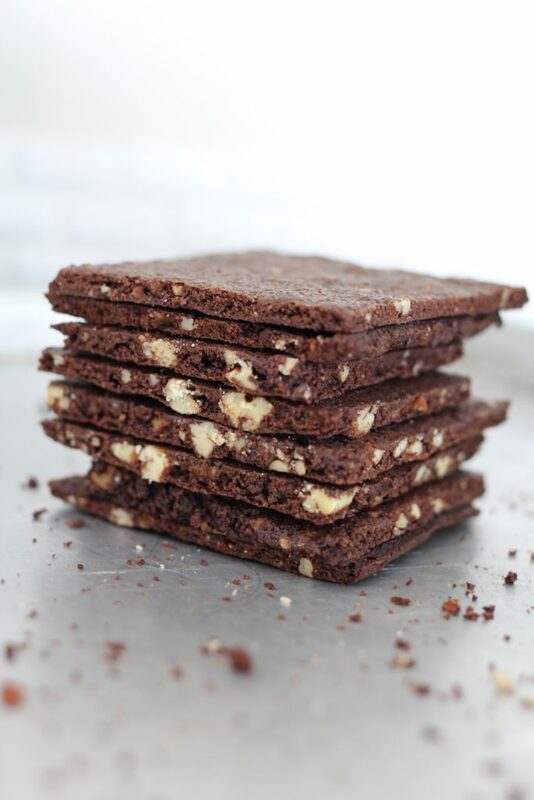 The egg white definitely makes a difference in the texture of the brownie brittle. 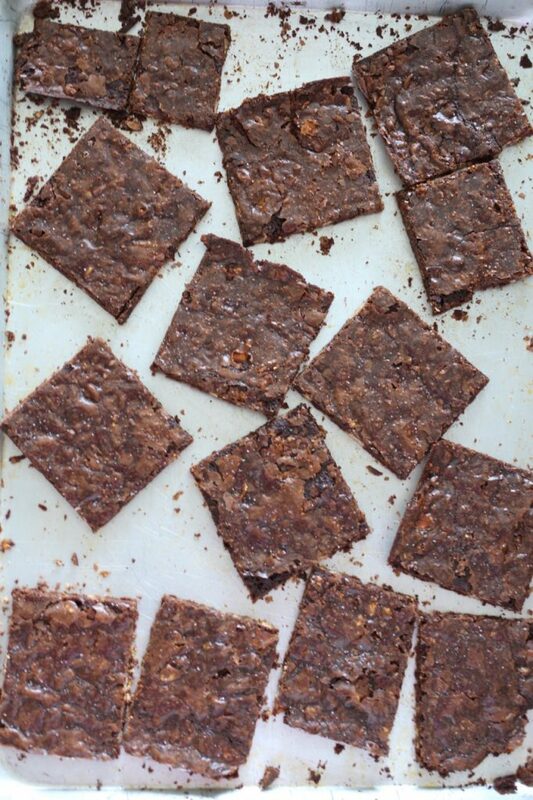 The brownie brittle made with eggs is good. Don’t get me wrong. But, the egg whites vs the whole egg make this recipe a little closer to the Sheila G’s store bought treat! Truth be told, this recipe doesn’t take much time. It’s worth the few extra minutes during the second bake to get the crunchy brownie texture. Salted Caramel Brownie Brittle is SO much better than buying a store-bought version, not to mention easier on the budget. 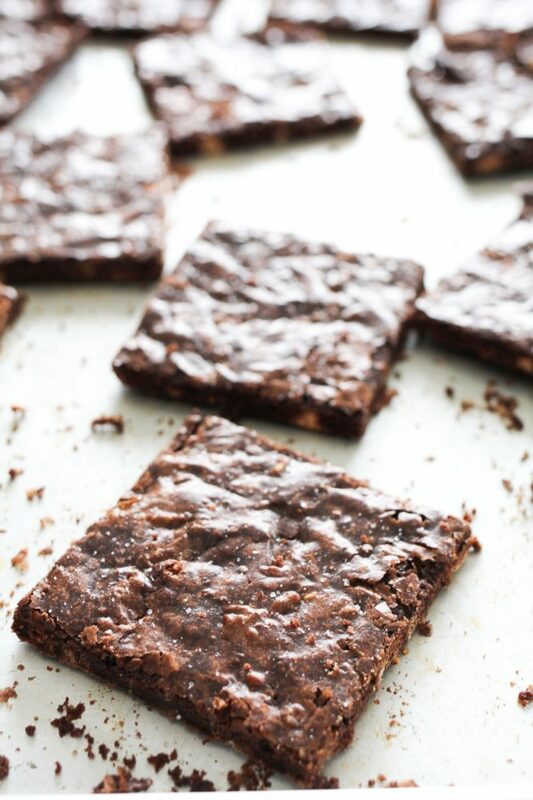 Crispy, delicious brownie edges made in your own kitchen, on your own time. That’s my kind of dessert. Sheila’s Salted Caramel Brownie Brittle is all the chocolatey goodness you love in a brownie, with a crunchy, delectable, thin texture. One of these squares is about 1/4 the thickness of a regular brownie, and still satisfies my chocolate cravings with less calories. Another bonus, Salted Caramel Brownie Brittle stays fresh for at least a week. I’m looking forward to using this recipe for birthdays, holidays, and any other occasion. It’s perfect for gift-giving. 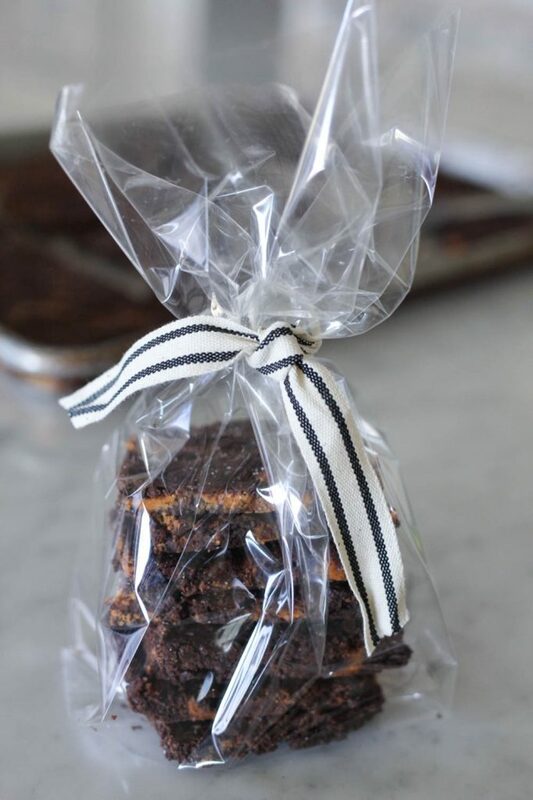 Just package it with a small brownie spatula for a cute and creative treat. You’ll never want to buy store-bought again after you try this homemade version of Sheila G’s Salted Caramel Brownie Brittle! 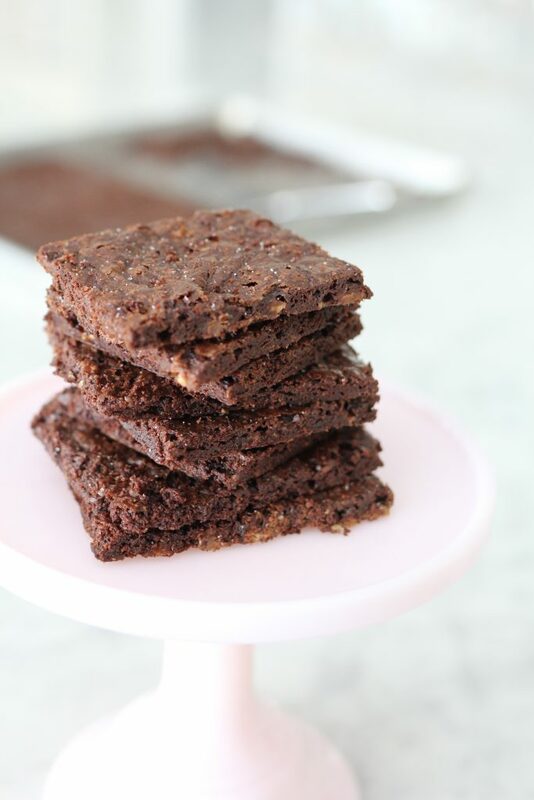 Salted Caramel Brownie Brittle is a brownie and candy in one yummy treat! Position a rack in center of oven; preheat to 300°F. Generously grease an 18x13 jelly roll pan. Using clean beaters and bowl, beat egg whites in a bowl until peaks form. Scrape out and set aside in a small bowl. Cut butter into tablespoons in bowl of a stand mixer, or large bowl (you may use same bowl used to beat egg whites). Turn mixer to low and slowly add sugar. Mix until sugar and butter are incorporated. If there are large bits of butter turn to medium to medium high speed and scrape down sides until butter is incorporated into sugar. Turn off mixer and add cocoa powder, paprika, vanilla, salt and flour to bowl. Pulse until all of the dry ingredients are mixed in. Do not over mix. Add beaten egg whites, and mix on low just until egg whites are mixed into batter. Fold in Salted Caramel Chips. Using a silicone or other non stick tool, spread batter onto pan. Don't worry about covering the whole pan. After placing pan in oven, you will be able to spread again. Bake at 300 for 5-8 minutes or until batter is melted a bit and looks glossy. Slide pan out of oven and spread the batter evenly, it should be very easy to spread at this point. Some of the chips will melt and become marbelized into the brownie batter. Immediately return to oven and bake for 20-25 additional minutes at 300. Remove brownies from oven and leave oven on. Using a table knife, cut the brownies. Place the brownies back in the oven and bake for an additional 10-15 minutes until crispy. Remove from oven. Immediately sprinkle with a little sea or kosher salt. Let brownies cool until easily removed from pan, about 15 minutes. cut again and serve. I have tried both parchment paper and baking directly on the pan. I think using a well greased pan makes it easier to spread the batter onto the sheet pan. Every oven is slightly different. Use your own judgement for baking this treat. 300 degrees works for baking initially. The second bake time after the brownie is cut will vary for each baker. The batter will cover the whole pan. Follow recipe directions and place pan inside of oven after the batter has softened and melted bit, it is simple to spread the batter to the edges of the pan. If you like the brownies to be slightly chewy, cook for about 15 minutes at 325, then remove from oven, cool and cut. I have tried using toffee bits in place of chocolate chips of salted caramels chips. I don't recommend the toffee bits. They melt and become very sticky, making it difficult to remove the brownies from the pan. The Salted Caramel Chips may also be placed on top of the brownies, but I like the pieces to be mixed into the batter. Covered or stored in an airtight container, the brownies will keep well in the pantry for 1-2 weeks. I loved this recipe! As a postpartum mom with a major sweet tooth, this was a perfect way for me to fill that craving with less calories (except I may have eaten 3/4 of pan in 24 hours). The first time I made it with chocolate chips and that worked great! The second time I tried using caramel bits, not chips, and that didn’t work too well. Next time, I’ll hunt down the salted caramel chips. The flavor is perfect! The first time I made it, I couldn’t find any salted caramel chips (every store I checked was out) so I ended up using butterscotch and they turned out perfect (almost, butterscotch isn’t salted caramel). Since that first attempt, I have tried several times using salted caramel chips and every time they turn out tough and chewy. I have tried doing different things with the chips to try and keep them from mixing into the batter too much, I have been so so careful to not over mix my batter and I still can’t quite get it. Baking is something I pride myself in mastering but somehow this is one recipe that I can’t seem to manage. Is there a trick I am missing? Hmmm that’s so weird, Joy. Maybe you could try baking them for a shorter amount of time. It sound like they might be over-baked. Thanks for asking! I just finished making this. But I did a vegan version. Instead of using the egg whites I did flax seeds. So I’m sure it wouldn’t have been the same because of the white fluff. But they are so delicious. I didn’t know what to think because of the egg substitute I would usually use. And I didn’t feel like using Aquafaba because it sometimes doesn’t taste right in recipes. Thanks for sharing this vegan version, Danielle! I’m sure it’s very helpful for other readers who are vegan as well.